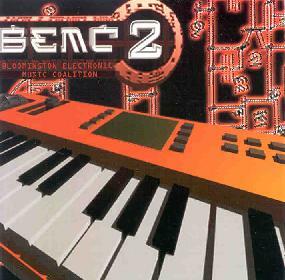 Various Artists - "Bloomington Electronic Music Coalition Vol. 2"
Obviously there's a lot going on electronically in Bloomington, IL, which doesn't sound like your typical musical "hot-bed", but then given the ability for certain reclusive weirdos to create computer-generated music these days, nothing should surprise us. As a warning regarding the title of this disc, the electronic music featured here is mainly focused on the beat-driven, techno side of that broad and effusive genre; in other words, "electronic-uh-" is mainly the agenda here. These mostly 5-6 minute tracks are competant, but then most of us bogged-down music fans are looking for a bit more than that, right? The XENOCHRONOUS WEAZEL starts the album off epitomizing the harsh, grinding, industrial-inflected sounds dominating the disc. SLAVE CYLINDER's track takes the industrial harshness factor to greater heights, and though it's one of the least melodic of the tracks, it stands out for its intensity, the brutal beat firing away a stacatto machine-gun blitz. ASLAN's "Mother Monarch" flows pretty well with its beat, loops and space-wave keyboards, and is another of the stand-out tracks. SHAWN DELANEY's track is pretty fun with its various bizarre samples, freaky synths and rumbling bass-drum beat. PART's "Myrrh: Pax Interna" is a more ambient, spacey piece and one of the better all-around tracks, less beat-reliant than most of the others. BOBBY MONO's "Mingus Vs the Megaloms" samples some sax and integrates it decently with the electronica. Ironically, one of more interesting tracks is "Electronic Bliss" by GAME BOY, which has a nice creeping bass-line and a great vocal (as in sung verses) - hey, why don't more of you guys try this?? An extra element never hurts, even if it would be considered "regressive" for the genre. The lyrics certainly aren't regressive, though, seeming to represent electronic life unabashedly. GRIER AND BENTLEY add some more variety with a gothic touch, and the electronics are interesting, but this personally ain't my bag. EXDEATH finishes it all off with some dark, beatless, intrusive ambience. Not bad, I guess, considering the entire amount of electronica currently pervading the planet. For more information you can visit the Nefarious Records web site. Contact via snail mail c/o Nefarious Records; PO Box 60625; Chicago, IL 60625.